The astronomical observations of the ancient Nilo-Saharans led to different orientations for their shrines and burial sites. The majority of the sites show alignment to meridian cardinal directions and the solar arc. This is evident also in the placement of the settlements of first and second royal wives on a north-south axis. Their settlements marked the northern and southern boundaries of their territories. The Creator's solar boat or chariot traverses from east to west. This was viewed at the Creator's daily journey between the eastern and western horizons. The rulers of Genesis 4, 5, 10 and 11 controlled territories along the ancient water systems. The extreme boundaries of their territories were marked by the settlements of their two wives. As the rivers were oriented more or less on a north-south axis, so were their wives. Abraham's first wife resided in Hebron and his second wife resided to the south in the area of Beersheba. It has been argued that part of the arrogance of Lamech (Gen. 4) is that his wives Ada and Zillah lived in separate settlements on an east-west axis. In this Lamech set himself as an equal to the One who rules the universe. As the Hebrew scholar Theodor Gaster noted, Adah and Zillah correlate to the Akkadian words for dawn and dust. These early rulers listed in Genesis provide insight into the thinking of the Nilo-Saharan rulers when it came to the orientation of their monuments. The earliest alignments adhere to either a solar orientation or a north-south orientation. Later sites are found with quarter-cardinal and south-north orientations. The temple of Hathor-Meri at Timna was built by the ancient Egyptians. Here the Egyptians oriented the temple to the rising sun at the winter solstice. Timnah in the Sinai is the site of the world's oldest copper mines. The oldest date to at least 4,000 BC, and there are newer ones as well, totaling about 10,000 shafts. At Timna there are ancient rock carvings showing Kushite/Egyptian warriors in chariots, holding axes and shields. A temple dedicated to Hathor-Meri (later called Isis) was discovered at the southwestern edge of Mt. Timnah by Professor Beno Rothenberg of Hebrew University. The 19th Dynasty tombs of Merenptah (fourth king) and queen Twosret were constructed so that the light of the rising sun on particular days of the year would pass through the burial chamber and strike the sarcophagus of the king. Queen Twosret is believed to be the second (cousin?) wife of Seti II. Her name has been found associated with the turquoise mines at Serabit el Khadim and the copper mines at Timna. The north-south orientation of shrines and tombs was established by observation of Mekhetyu, the circumpolar constellation identified as the Plough. Meskhetyu is mentioned in the Pyramid Texts as an “imperishable” group of stars. This constellation was associated with Horus, whose totem was the falcon. The falcon-headed Horus supports the platform of Meskhetyu. In 2005 Tomb 23 was discovered at Nekhen in Sudan. This was the largest structure of its kind from the Naqada II period (c.3500 - 3200 BC) and it was oriented north–south. King Horemheb, the last king of the 18th Dynasty, built two tombs. His tomb (designated KV57) is in the Valley of the Kings and his old tomb is at Saqqara. The axis in degrees of tomb KV57 is 357.72 and the orientation of the axis is north. This represents a later development which subsequently became the norm for most of the royal tombs in the Valley of the Kings. Horemheb was from Nekhen, the oldest known shrine city dedicated to Horus, the patron of kings. 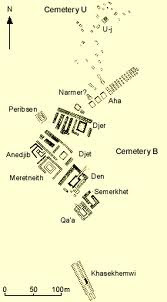 Nekhen is south of his Theben necropolis and likely Horemheb's choice of orientation was simply to face north from his home. Horemheb's old tomb at Saqqara was used for the burial of his queen Mutnodjmet. It was built between 1333 and 1323 BC. Mutnodjmet was Nefertiti's sister. Another orientation resulted from rotating the N-S line by 45°, 90° or 135°. This quarter-cardinal orientation is especially evident at Upper Nile/Nubian shrines. This rotation meant that the definitive axis was aligned either perpendicular to the Nile or parallel to the Nile. At most of the temples at Thebes the axes of the monuments were rotated by 135° from the astronomical north-south line. This mean that the temple facades were almost perpendicular to the Nile. Many sacred shrines of the ancient world faced great rivers. During the Middle Kingdom (c. 2000 BC) excavations were made by the Egyptians at Abydos, located south of Cairo. Apparently, they were searching for the tomb of Osirius, who was believed to be one of the first kings of Egypt. The tomb of Djer was identified at that time as the burial place of Osiris in Abydos. Because it was believed that Osiris was buried at here, Abydos became an important cult center during Abraham's lifetime (c. 2000 BC). The modern name for the site is Umm el-Qaab, which means “Mother of Pots” in Arabic. This name is due to the great number of Late Period sherds scattered in the piles of debris. By 3400 BC Abydos had developed into an elite cemetery, and between 3050 and 2700 BC, it became the burial site of the kings of Egypt. Since 1977, the area has been excavated thoroughly by the German Archaeological Institute. Abydos comprises three areas. Cemetery U which is situated on a plateau, dates to the early Naqada Period (c. 4400-3700 BC). It contains 650 graves. Abydos was an important shrine city at the intersection of the Nile, and a traffic route from the Red Sea through Wadi Qena to the oases in the Western Desert. Cemetery U was in use throughout most of the Naqada Period (4400-3000 BC). Seven large tomb complexes have also been identified. One of these is identified with king Djer, son of Hor-Aha. Hor-Aha's first wife was Benerib and his second wife was Khenthap. 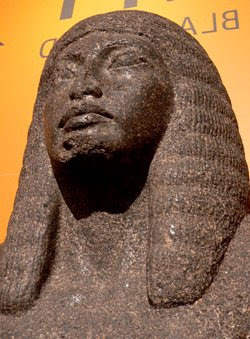 Khenthap is named as king Djer's mother on the Cairo Annals Stone. Again we find the early practice of rulers having two wives, as was the custom among Abraham's Horim.